Teak is a hardwood tree species otherwise known as Tectona Grandis. This species is typically found in tropical areas such as Asia, India, Indonesia, Malaysia, Africa and the Caribbean. This type of wood is harvested and commonly used in the construction of outdoor furniture, boat decks and other projects where teak’s natural moisture resistance is an asset. 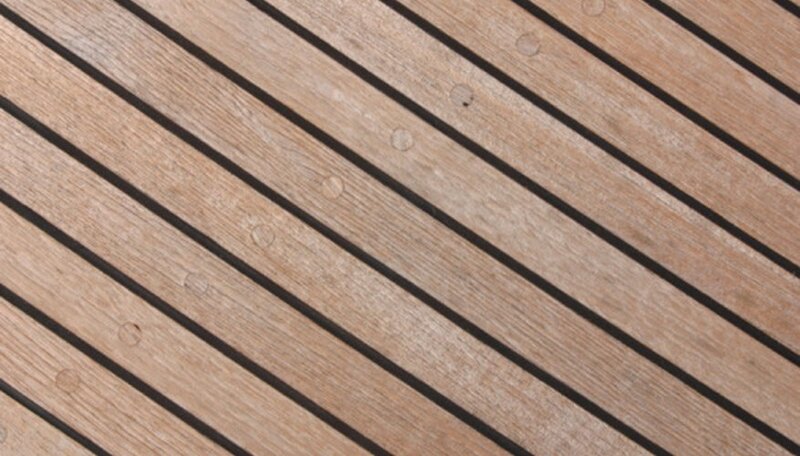 Teak can be steamed and bent to follow the contours of boat decks and furniture. Using this method, an entire chair can be formed without cutting the material, which increases the structural integrity of the project. Measure, mark and cut a piece of PVC pipe that is 7 feet long with a hacksaw. Center the cut piece of PVC pipe on two sawhorses spread 6 feet apart. Tape the PVC pipe to the sawhorses to hold the pipe in place and prevent rolling and shifting. Slide a PVC end cap on the left end of the PVC pipe. Cover the joint of the end cap and the pipe with duct tape to seal the two pieces together. Drill 1-inch holes along the length of the PVC pipe. The holes should be spaced 12 inches apart and be at the top center of the pipe. Drill a 1-inch hole in the left end of the PVC pipe. The hole should be 6 inches from the end cap and be at the bottom center of the pipe. Slide one end of the pouring tube in the hole drilled in Step 6 approximately 1 inch. Tape around the intersection of the pipe and hole with duct tape to seal any spaces. Fill the metal gas can with water and insert the pouring tube into the gas outlet. Tighten the exhaust valve on the gas can. Place the metal gas can on top of a propane burner. Slide a piece of teak wood into the right end of the PVC pipe so that it lays flat and the edges are supported by the edges of the pipe. Slide the remaining end cap on the right end of the PVC pipe. Tape the two pieces together. Turn on the propane burner and ignite the gas with a match. Watch the pouring tube until steam starts to flow through it. Using a stop watch, allow the wood to sit in the tube for one hour per 1 inch of wood thickness. Turn off the propane burner and blow out any remaining flames. Put on your gloves. Remove the duct tape and end cap from the right end of the PVC pipe. Remove the piece of teak and quickly transfer it to the area of installation. Bend the piece of teak using your hands, feet and body weight to snugly follow the contours of the application area. Place clamps along the length of the teak board to hold the bend in place. Allow the teak to cool and set for approximately 24 hours. Do not attempt to remove the teak without gloves. The wood will be hot and may cause burns.